Are you looking for the ideal way to bring your home back to its original Victorian or Queen Anne architectural stylings? Between 1839 and 1900, this era is considered a crucial time in Britain’s architectural history. The Industrial Revolution was taking place, where a series of architectural revival styles were taken from the past to create the asymmetrical ‘Victorian’ style that we see many examples of around Ipswich and the surrounding Suffolk areas today; Ipswich is one of England’s oldest towns after all. Due to the prevalence of these homes, Victorian windows are an area we have a great deal of experience with. Referring to the reign of Queen Victoria, between 1855 and 1885 the Gothic Revival featured heavily in Victorian property designs with brick as the main material choice of the day. Typical features of ‘Victorian Gothic’ were ornate designs where the likes of pointed arches, patterns, intricate bay windows and stained glass featured heavily. Other architectural styles that became fashionable during this period were Italiante and Neoclassicism mixed with various Middle Eastern and Asian influences, where the addition of many intricate window frames became a classic Victorian trait. Queen Anne architecture originally referred to the reign of Queen Anne (1702-1714), which saw a popular revival in Britain near the end of the 19th century. This architectural style is recognised by its rich red brick use, windows with glazing bars, terracotta tiles & panels and doors covered with timber hoods. Rows of painted sash windows in boxes flush with the brickwork and oriel windows, often stacked above each other, were also typical features of the Queen Anne revival style. 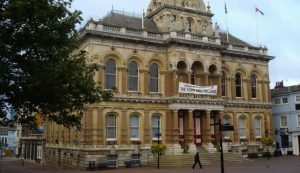 Ipswich Town Hall is a classic local example of the typical grand Victorian architecture we’ve all come to know and love. Constructed in 1868 for just £16,000, if you look closely you’ll notice that the town hall clock is adorned with quintessential Victorian busts alongside other detailed carvings. Featuring an array of bay window sizes, complete with the classic Victorian sash horn on the bottom edge of the upper sash, it’s not hard to see why this building has been granted Grade II listed building status. Ipswich’s’ Fore Street Baths are also a notably elegant example of local Victorian architecture that’s still in use today. 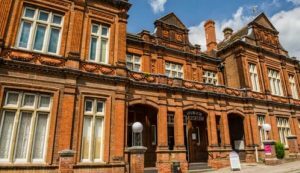 Ipswich Museum is a lovely local example of the typical stylings of the English Queen Anne 19th Century architectural revival. With its English Baroque inspired roof combined with the archetypal rich red brick, deeply shadowed entrance and broad porch area, if you look closely you’ll also notice the classic flush sash window features too. To keep your period homes authenticity intact, it’s always best to replace like for like wherever possible. Our timber window range remains a firm favourite with Suffolk homeowners, especially those with Victorian properties. Durable, naturally insulating and aesthetically pleasing, all of our timber is sustainably sourced to fulfil our lifelong pledge to protecting the environment. Complementing and enhancing the authenticity of many 19th Century homes across Ipswich and the surrounding areas, our timber window frames can truly last a lifetime. 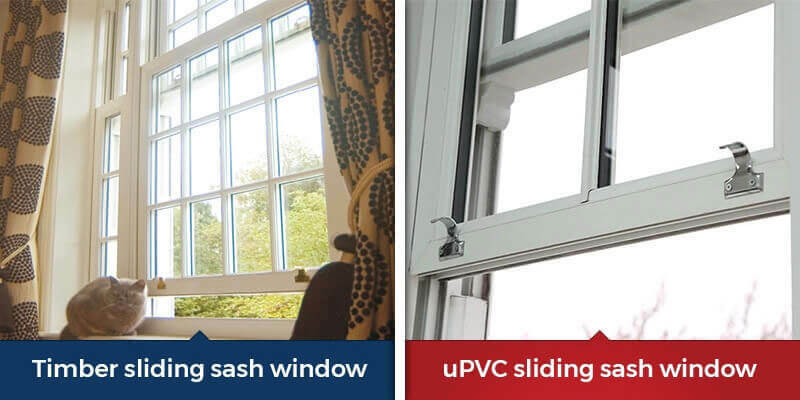 Related to this post: Which window material is right for you – uPVC, aluminium or timber? For vintage windows that are beyond restoration or repair, our range of timber alternative windows seamlessly combines the beauty of timber alongside the cutting-edge performance of uPVC. Offering outstanding thermal efficiency, as well as low maintenance and enviable customisable qualities, this means that homeowners never have to choose between performance and charming aesthetics again. Listed buildings and homes situated in conservation areas should seek advice before making any changes to their windows, as consent may be required by law. This is where our expertise with heritage windows and conservation area approval really comes into play. Whether you’re looking for ‘Victorian Gothic’ timber glazed bars, beautiful bay window restoration or classic flush sash window installation, we have a wide range of options to accommodate Victorian and Queen Anne revival style window designs. Even if you don’t have a Victorian property, our range of glazed products will enhance any home they’re applied to. Doors from this era typically had ornately carved panels, impressively combined with beautiful stained glass and polished brass door furniture. With a range of timber, uPVC and composite doors on offer, why not enrich your homes period character with a new door to match your charming new windows? Or if you share the Victorians’ love of entertaining, why not consider a time-honoured Victorian conservatory installation? For further insight on how to rejuvenate your heritage home, get in contact with the SEHBAC team today.